Complementing our Power Issue, Priyanka Chopra’s look was conceptualised to be bold yet wearable. When sporting darker shades of lip colour, stay away from clashing shades anywhere else on the face. Fuller lashes are big this season, and glittery make-up is something you must skip. Our definitive guide along with product options will help you recreate this look. 1. Complexion Prep the skin with a hydrating moisturiser so it plumps up to reduce any signs of fine lines. Layer it with liquid foundation for a dewy effect. 2. Eyes Sheer eyes are a very important feature, so use a black eye-liner to give it definition and you can add a strip of false lashes to enhance the look a little more. 3. Cheeks Contour the cheeks to give a ‘high cheek bone look’ by using a brown blush just in the hollow of the cheeks, and then a lighter blush on the cheek to intensify the visibility. 4. Lips Prep the lips with Vaseline to get rid of any dryness. 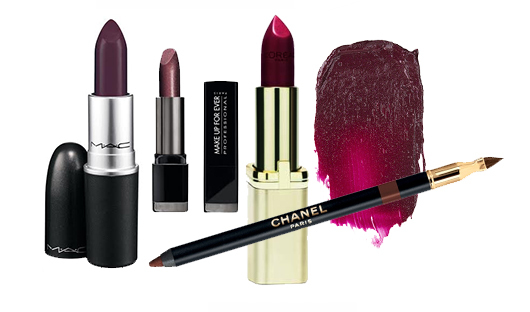 Use a lip-liner to define the lips and finally fill it in with a deep purple colour.